THERE WILL BE PLENTY of apples in New England’s orchards this fall, despite a smaller-than-normal crop. The region as a whole experienced scattered frost and hail damage, but avoided the devastating crop losses from an early freeze in Michigan and New York state. 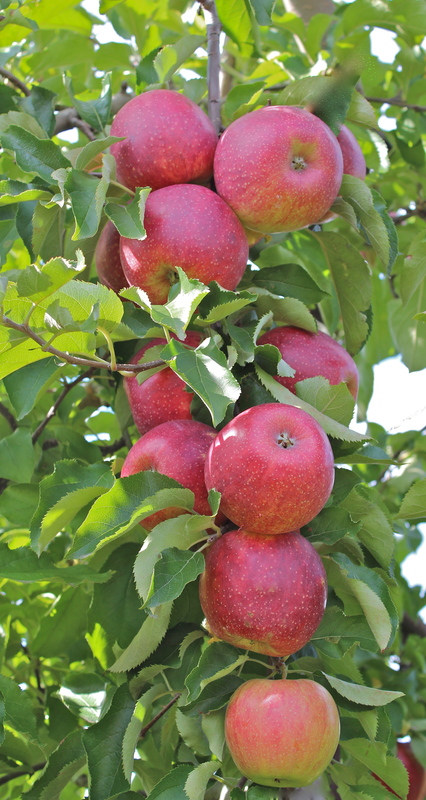 The New England apple crop is early, though, by as much as one or two weeks in some areas, so consumers should begin to look for fresh apples now. Some early varieties are already being picked, and the 2012 fresh harvest will be officially launched with New England Apple Day Wednesday, September 5. The commissioners of agriculture of all six New England states will be visiting orchards that day to sample the new crop and meet with growers. A March heat wave produced early blossoms in much of the Northeast, and several cold nights followed in April with temperatures in the low 20s. Apple blossoms can withstand temperatures in the upper 20s, but anything lower will kill the flowers before they can bear fruit. The result of the freeze was a historic loss in Michigan, which expects just 15 percent of a normal crop, and in New York state, which will have only about half of its usual fresh harvest. In New England, some orchards were affected, but the damage was nowhere near as widespread. Scattered hail damage further reduced the New England crop in July. Still, many orchards are reporting outstanding crops, and it is shaping up as a good season for fresh-picked despite the lower numbers over all. The main impact for consumers is expected to be in the price of fresh cider, since there will be far fewer apples available for processing. The 2012 United States apple crop is expected to be about 10 percent smaller than the 2011 harvest, according to USApple’s annual forecast. The 202,114,000 boxes forecast for 2012 is about 10 percent below the five-year U. S. average of 224,284,000 boxes. New York’s predicted crop of 14,000,000 boxes in 2012 is down 52 percent from a year ago and 54 percent below the state’s five-year average. Michigan, at 3,500,000 boxes, will be down 85 percent from 2011’s crop, and 82 percent below its five-year average. Washington, the nation’s largest apple-growing state, estimates a record 2012 crop of 145,000,000 boxes, 13 percent above its five-year average. GRAVENSTEIN IS AN HEIRLOOM apple with a thin skin and a juicy, sweet-tart flavor. It is prized for its culinary use, especially in pies, sauces, and ciders. Harvest is early, beginning in August, and like many early varieties, they should be eaten soon as they do not store well. 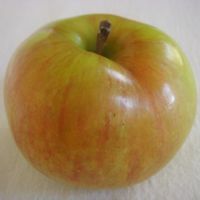 Gravenstein’s origin is not certain, but it dates back to 1797, and is strongly identified with Denmark (it was declared Denmark’s national apple in 2005). 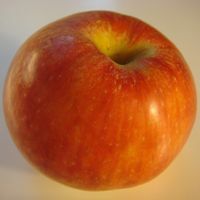 Gravenstein may be one of four European apples imported to the United States by the Massachusetts Horticultural Society in the 1800s. Despite its outstanding flavor, Gravenstein has never achieved great popularity, probably because it can be difficult to grow. It prefers a mild climate and is prone to several diseases. Red Gravenstein, an offshoot of Gravenstein, is redder in color than Gravenstein, with pink and orange hues. Red Gravenstein is highly acclaimed for its distinct sweet-sharp flavor, similar to Gravenstein but less tart. Red Gravensteins are picked in September. Red Gravenstein may also have its origin in Denmark. In the 1820s the London Horticultural Society distributed it to Massachusetts. This recipe, adapted from one that appeared in 2000, in Gourmet Magazine, features Gravensteins, and it has all the makings of a classic: easy to make with great apple flavor. Topping: In a cast iron or other ovenproof 10-inch skillet, heat butter over moderate heat until foam subsides. Stir in brown sugar and remove from heat. Spread mixture evenly in skillet and arrange apples, overlapping, in a single layer. Cake: Combine all dry ingredients in a large bowl. Cut in butter with a pastry knife until mixture resembles coarse meal. Add buttermilk, stirring just until mixture is moistened. Spread batter over apples, leaving a one-inch border to allow cake to expand. Bake in middle of oven 25 to 30 minutes, or until cake is golden brown and firm to the touch. Cool cake in skillet on a rack for three minutes, then invert onto cake platter. 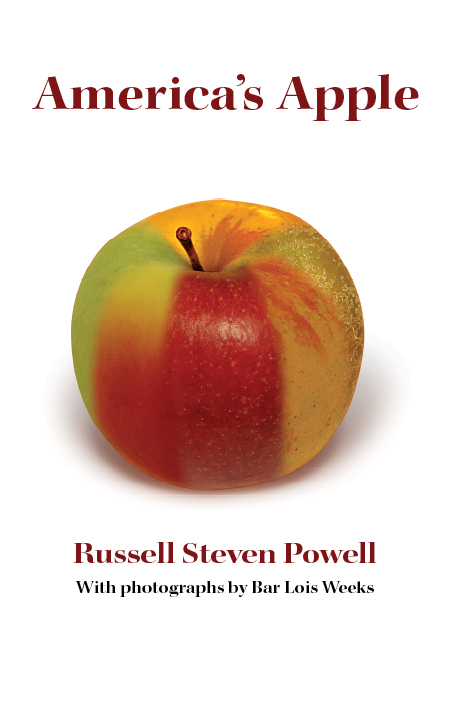 ALMOST ANYTHING you want to know about apples can be found in America’s Apple, a new book by Russell Steven Powell. The book has chapters on such topics as how apples are grown and the people who grow them, Johnny Appleseed, culinary uses and apple drinks, food safety, and more. America’s Apple features nearly 50 full-color photographs by Powell and Bar Lois Weeks, plus a photographic index of 120 apple varieties grown in the United States. To learn more, visit America’s Apple.